Street Fighter x Tekken vs KoF vs Capcom vs Tiny Titans? I’m doing a lot of project juggling right now, so this update is a bit on the tiny side. Don’t worry, because future updates will more than make up for it. More on that later. GFX Generators: Nothing big here, but I started a few modifications to the engine to streamline some of the older coding. Please let me know in the comments section if you run into any errors so I can work on those. Characters: Heihachi added to Namco section. 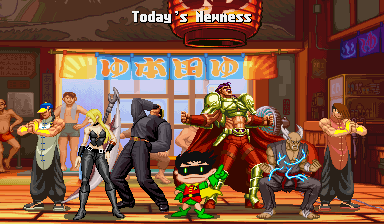 Trish, Yun & Yang (same character slot) added to Capcom section. Mature, Vice, Yamazaki and Wolfgang Krauser added to SNK section. A new Tiny Titans character slot was added to the DC section (though Tiny Titans sprites will be added to individual characters when applicable). 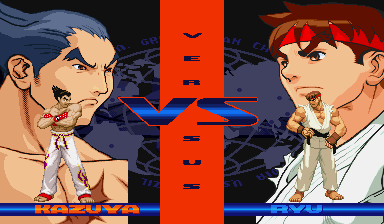 Screenstyles: KoF2002 Mexico (day), MvsC Bath House (left and right sides) added to the variable bg styles in the Group and Vs generators. Custom Sprites – Heihachi (including a slightly animated version) added to Namco section. Trish added to Capcom gallery. Robin added to the DC Comics gallery. Future updates are going to be smaller and farther apart for a while as I work on some other projects. One of them is project I’ve been teasing for years and it’s time for me to get back on that line art grind. Don’t think I’m slacking on the pixel mapping (and bad rhymes) because some of those future updates are going to be big. I’ve actually finished a few smaller things for some future theme-based updates. Tiny Titans Robin may have broken the comic book drought this place has had for a while, but keep an eye for more than one comic update. I’m also working on that Golden Age of Video games update, but I’m not exactly sure when that will drop. There will be new posts on this page with news, WIP updates, teasers and some theme-based request posts. Those request line posts will be limited-time offers, so be there and be vocal. Beta V 1.0 is out. I haven’t checked it out yet, but I’ve already downloaded it. Check it out just in case the bigger blabbermouth news sites cause a cease & desist or something. You know how this crap goes. Elevator Action Deluxe owners should know that there is a new DLC stage pack available this week. Don’t forget to pick up any of the free DLC characters you missed from before. It’s great to see that Square and Taito continue to add things to this game, even though the later levels of this game are still too tough for me. Last, but definitely not least, Dynamo has a new post on NXISTENCE.NET about the pain of dealing with younger video game fans who just can’t understand what we see in all of these old games. It’s well worth a bit of your time to read it and know that you’re not alone on that issue. Graphic Generators – I just made a small character update. Capcom: Ibuki added. Poison (new SF3-to-SFA-like edits and a new palette), Ryu (SFA3 portrait headband edit) updated. 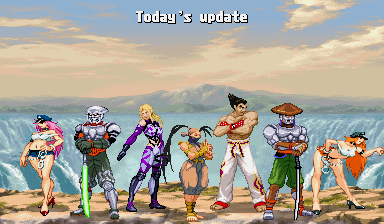 Namco: Nina, Kazuya and Yoshimitsu make a invasion with new scratch-made sprites. Mini-Logos – A Street Fighter IV-styled Street Fighter logo added to Capcom section. 70’s and late 80’s Avengers logos added to Marvel section. Illmosis and ScrollBoss logos added to Illmosis section. Custom Sprites – Scratch-made sprites of Nina (Tekken 5), Kazuya (1, 2 & 5) and Yoshimitsu (2 & 3) were added to the Namco page. edit: I also re-sized the scratch-made sprites of the Dolls from Growl because I didn’t notice that they were too tall. Dynamo just posted a breakdown of his five favorite BGM tracks from TMNT IV and it’s worth a read. The man is uniquely qualified to make these posts since he thinks about games on a nuts and bolts level AND he crafts some fine music himself. He also makes a reference to one of my favorite musicians in the description of the #1 track. Look that name up on YouTube if you don’t recognize it when you get to it. You’ll be glad you did.